3d glasses, Barcelona Light Festival. Cats seem to love to fit into "too-small" places, to sleep. Here are examples, taken in the past few weeks at home. First, my very large, medium-haired Orange Tabby tomcat, Sanderson, in a box. And, my 12 year old swimming cat of Turkey, the Turkish Van cat girl, "Helva" (Turk. : "Honey"), at the base of a Fiddle-Leaf fig tree, in the foyer, here. Last edited by desert_woodworker on Sat Apr 07, 2018 12:11 am, edited 1 time in total. Never seen any of the cats here lie on a plant, funny! Here's Fuki (fukasetsu) "picking" the small box over the big one. Ah; so, Fuki has a name-sake kitty-cat! Nice kitty... .
And, somebody wears New Balance shoes (the Human, I suspect). Fuki! (the Human... ): please send me your snail-mail mailing-address again, in Private Mail, here. I lost it when ZFI went down. I want to send you some fronds of Creosote Bush, our deliciously-scented desert plant. Just moisten the leaves and stems when they arrive, and drink in the scent of the Sonoran Desert of U.S.A. and Mexico. It's legal! In-flower, now, too. No one else would do this for you! Be well, Jimbo. I mean, Fuki-bo. A Lenticular Cumulus cloud, in Sonoran Desert, USA. 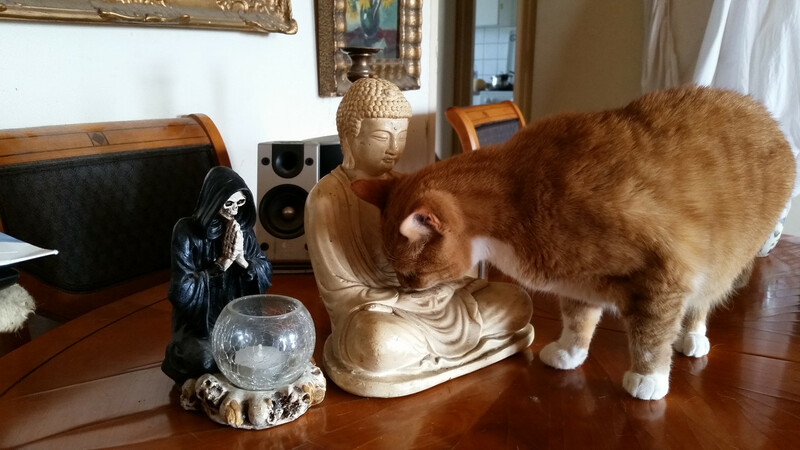 Fuki, like the Buddha statue. Still waiting for spring at Korinji. Thought folks might enjoy this shot, taken from the second floor of our residence the other day. View looking down toward the zendo. The scene is actually white now, with 6" of snow on the ground and more coming tonight. I don't know Viktor, got it from "the ex" about 15 years ago approx from the 2nd hand store she worked. Once got a big green stone Mansjuri from mom but that one got decapitated (literally) had a few small ones too beheaded, seems like the head's the first to go when falling/failing, such grace eh. This one seems to be a sticky, the first one. Thanks Meido, I love the fog and "season's dreaming"
instantly reminded of a poem of a Brother. to see who’s looking through your eyes. blanketing the whole white world in silence. hovering like an impersonal angel around my meager camp. sounding faintly in the swirling mists. Is that someone bowing at the step of the building? Do you bow when entering/leaving the building? Just curious. I know it's customary to bow when entering/leaving the zendo. the poles of the spinning world. What is the goal of the Patriarchs? We bow when entering and leaving the actual meditation hall inside that building. The person in the photo on the steps is probably putting boots on...it's been muddy since our landscaping can't be done until the ground thaws. How precious! Amazing how everything meets here, bows. I acquired one of Kawashima's serigraph prints a couple of months ago.